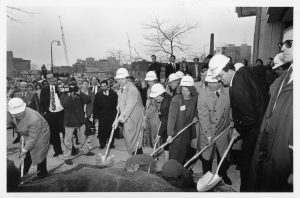 UWM Chancellor John Schroeder (at right) and others, Business Administration Building groundbreaking, 1992. Photo: Alan Magayne-Roshak. UWM Archives. Former University of Wisconsin-Milwaukee Chancellor and Emeritus Professor of History John Schroeder will present a talk on UWM’s history on Wednesday, April 19, 2017 at 4 p.m. in the fourth floor Conference Center of the UWM Golda Meir Library, 2311 E. Hartford Ave.
Schroeder will describe how UWM overcame obstacles to rise from a fledgling university in 1956 to a major research university in 2016. His talk will focus on the initial three decades of UWM’s history as a new university. Between roughly 1956 and the late 1980s, UWM faced and overcame successfully a number of challenges and obstacles which put the university firmly on the road to achieving Research 2 status in the mid 1990s and then Research 1 status in 2016. John Schroeder served as Chancellor from 1991 to 1998. He is the author of six books, including The Battle of Lake Champlain: A “Brilliant and Extraordinary Victory” (2016, University of Oklahoma Press). The presentation is hosted by the UWM Archives.